Welcome back to all you fabulous regulars who join me each week for these fascinating interviews. It’s great that you are here. If this is your first time, just a little background info for you: I like to provide a behind the scenes look at the writing and publishing world. I have been keeping tabs on my own journey to write and publish a novel series but I also wanted to branch out and offer you a glimpse into what it is like for others in this industry. 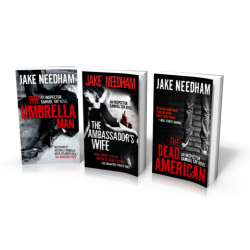 Today, I have the pleasure to introduce you to author Jake Needham. 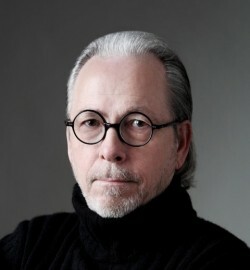 He has written and published a number of successful novels. Let’s jump right into the author interview and hear more from the source. Welcome Jake, thanks for being here. Can you please start by telling my readers a little about yourself? My name is Jake Needham. I was born on a ranch in Texas, but I’ve lived in Asia for most of the last thirty years. This has given me the opportunity to…well, let’s just say to do a lot of interesting stuff. “Needham certainly knows where a few bodies are buried,” Asia Inc. wrote about me. I should hope so. I helped to bury enough of them. And what made you decide to become an author? Through a series of accidents and coincidences too ridiculous for anyone to believe, about twenty years ago I began writing and developing movies for American cable television. When I realized how little I actually liked American cable television, I decided to see if I could figure out how to write novels instead. Since then, I have published eight crime novels set in the cities of modern Asia and the ninth is due out later this year. The English-language editions of my books have been distributed in most international markets and translated into several other languages. I have sold hundreds of thousands of copies worldwide. But, sadly for me, none of my books have ever been available in North American in their print editions, only as e-books. I know that is disappointing that they aren’t available in print here in North American but those are still really impressive numbers! And being translated into other languages is exciting too! It’s great when you’ve got a series that you can keep developing. I love reading series and I imagine it’s fun to write them (and have an audience ready and waiting for you to release more doesn’t hurt either haha). Let’s talk a bit more about your crime series. It surrounds the incredible character Jack Shepherd. Can you tell my readers a little about it? I’m glad you like Shepherd. I’ve become pretty fond of him myself, particularly now that I’ve journeyed through four books with him. Shepherd was once a high-flying international lawyer in a big-time Washington DC law firm. He knew a lot of people who were members of the innermost circles of government power, some of them even in the White House. Then suddenly, to everyone’s surprise, Shepherd abandoned Washington for the lethargic, backwater of Bangkok and became just another unremarkable professor at an unimportant university in an insignificant city. At least that’s what his friends back in Washington thought. 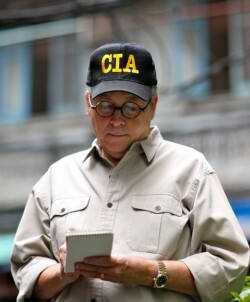 The truth about what he’s doing in Bangkok is a bit more complicated than that and considerably more interesting. That’s why I’ve written four books about him, so far. That’s always fun when you discover a character that’s so fascinating you can keep them going for so long. Having an interesting protagonist can really make the whole series. It helps build reader loyalty too. Wanting to see what happens next or how the MC will react to the situations the author creates for them, keeps the reader coming back book after book. That’s great that you’ve managed to create that with your Jack Shepherd novels. Were these you first published novels? My first novel was The Big Mango. It’s about a guy whom everybody thought knew where ten tons of money had disappeared to back in 1975 when the North Vietnamese chased us out of Saigon. It turns out he did know. He just didn’t know that he knew. 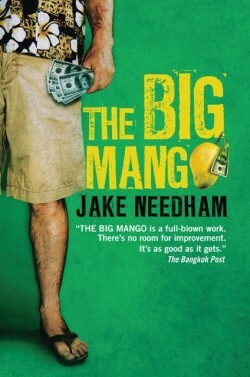 The Big Mango was first published fifteen years ago and almost immediately became something of a cult hit among foreigners living and visiting in Thailand. Even better, it attracted almost constant attention from Hollywood from the day it was published. It’s hasn’t been made into a film yet, though I’ve been paid for the right to make a movie from it almost more times than I can remember. It’s been a great little earner. Can you tell us a bit more about your journey to get The Big Mango published? I was writing screenplays and got really sick of movies, so I sat down and wrote The Big Mango just to see if I could write a novel. I honestly didn’t think much one way or another about getting it published. 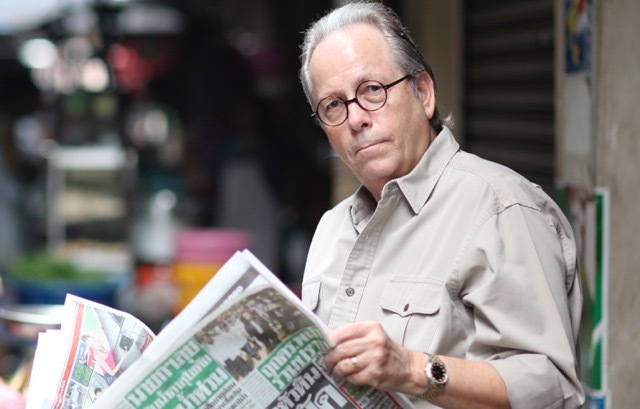 Since it was about a man who went on a sort of treasure hunt in Thailand, I offered the manuscript to what was then the only English-language publisher in Southeast Asia. It was a company called Asia Books. They said, sure, and published it in 1998. Although Asia Books didn’t have the ability to distribute it very widely – Southeast Asia was the only place they ever made it available – they sold over 100,000 copies in just the first couple of years it was out. That was when I decided I had better start taking this stuff seriously. That sounds like the publishing story every author dreams of, presenting our first novel to a publisher and not only having them agree to publish it, but have it sell so many copies! What would you say attributed the most to this initial success? I think success as a novelist is mostly a matter of good fortune. Some stunningly awful books get published and are pushed so hard by publishers that they sell hundreds of thousands of copies in spite of being terrible. Then, on the other hand, some really wonderful books never get published at all or do get published and then just languish in warehouses when publishers lose interest in them. To be successful as a novelist, all the right pieces have to fall together in exactly the right way and at exactly the right time. That’s more a matter of good luck than it is the quality of our work. It certainly seems like luck plays a large part. I still think it’s worth mentioning that an author has to put the work into their novel and be brave enough to put it out there that plays an important part as well. But you’re absolutely right, this business is hard to break into. There are a lot of obstacles that rise up to keep us from achieving our dreams. What were some of the obstacles you faced in publishing? The worst problem for me has always been getting adequate distribution. For example, none of my print editions have ever been available at all in the US in spite of selling very, very well in Asia and Europe. “Needham is probably the best known American writer almost nobody in America has ever heard of,” Hong Kong Magazine once wrote about me. Maybe they’re right, but I still don’t know whether to laugh or cry about it. I was published initially by regional publishers in Asia and then by a UK publisher, and none of them were ever able to get printed editions of my books distributed widely enough to reach the international audience I’ve built up. I was constantly embarrassed by the complaints I received from people who wanted to buy my books and couldn’t find them in their local bookstores. That was really the reason I terminated my print deal altogether a few years ago and am now published only in e-book formats. I would love to have print editions out there on bookstore shelves, but no publisher with the ability to distribute my print editions all over the world with real marketing support behind them has ever shown the slightest interest in me. So I’m pretty happy my stuff is published now in e-book formats. At least that way people who are interested in my books can find them regardless of where in the world they happen to be. A question I like to ask a lot is, what is one thing you wish you had known before you published? It usually gives a lot of insight to new authors and I believe is very helpful for those of us hoping to break into this industry. Honestly? I wish I had known how little most publishers care about writers. Oh, they make all the right noises, of course, and they go on and on about how without us they would be nothing, but they don’t mean a word of it. Many publishers see writers as interchangeable commodities. As long as they have enough of us, they don’t generally care all that much which ones they have. And if one of their writers isn’t meek and grateful and happy to take whatever they give him without complaint, they’re happy to get rid of him and get another writer who will be. No writer should ever trust or rely on a publisher. Your career is your responsibility. Your publisher really doesn’t care about you one way or another. Well I always encourage my fellow writers to be cautious about who they get into contractual relationships with (the lawyer in me can’t help it). But I think there are some publishers who care about their authors. Of course we need to remember that most publishers’ have the prime goal of making money or else they wouldn’t be in business very long. That is important to remember, that it is a business and we also need to be ready to be the biggest promotor of our own work no matter if we self-publish or go with a traditional publisher. We have to be ready to sell our own work. This is why many authors have taken so strongly to social media. In fact I “met” you on Twitter. You have a really large following there on Twitter. Do you think social media and your presence on the web have been helpful to your career as a writer? I really don’t know. I’ve always used Facebook and Twitter to engage with readers, and I don’t use any of the other platforms at all. I don’t have anything against other platforms, but there are only so many hours in the day. I enjoy talking to readers on social media, but do I sell more books because I do? I really don’t have a clue. With the large number of social media sites out there, I don’t blame you. It takes a lot of time to have accounts on so many sites. It’s better to focus on a few social sites and do it really well, then spread yourself too thin and do it poorly. Do you have any tips or suggestions for authors trying to build up their social media accounts? I don’t think social media is really all that different from any other form of interaction with people. It works just like my mother used to tell me the world does. Just remember to say please and thank you, and you’ll be fine. Haha, I love that! Mama knows best! “Catching more flies with honey than with vinegar” I believe is the saying that applies here. And it’s a widespread axiom for a reason, because it’s generally true. If someone is rude to me, I’m less likely to engage with them and vice versa. As we wrap up this interview, what advice would you give to my readers who are also pursuing or hoping to pursue a literary career? You have to understand right from the beginning that the odds of success are really lousy. Especially if you see success as earning a decent enough living to support your family and send your kids to school. There’s almost no chance you’re ever going to do that as a novelist. If I hadn’t already had a bit of financial success in the movie business, I would never have been able to be a full-time novelist. It’s simply very, very hard to earn a living writing fiction. Regardless of what you may think, almost nobody does. There’s Stephen King and then there’s…well, everybody else. It’s good to have realistic expectations. I’ve found that being strongly disappointed often leads to giving up. But if you start the process knowing what it is you’re getting into, you’re more likely to stick it out and achieve your dreams. You won’t be waylaid by crushing disappointment, you will be expecting the obstacles you face and the hardships and you will be in a better frame of mind to endure them. Thank you for giving us this behind the scenes look at what it’s like to write and publish a novel series. Just one more thing, can you please tell my readers where they can go to purchase your books? You can browse all my titles at my website: www.JakeNeedham.com. You can even read the opening chapters of each title (there’s a link in the upper right hand corner of each title’s page) and listen to the first few minutes of each audio book. Excellent! That concludes this week’s interview. Thank you for joining us today. I hope you found it enlightening. Come back next week for another author interview and more behind the scenes glimpses of what it’s like to write and publish a novel series!